20.09.2016. University studies, work experience abroad, leadership tasks – successful trainees of the Friedhelm Loh Group have the world at their fingertips. The 43 new trainees who make up this year’s intake can look forward to an exciting time of learning and work with a top employer. Vocational training is one of the most formative phases for the individual’s personality development, was the message passed on to them by company owner Dr. Friedhelm Loh. A fruitful traineeship is decisive in shaping our career future. Page 3 The new trainees can look forward to a highly dynamic environment and the backing of the largest employer in the region. Dr. Loh went on to discuss the range of training measures the company uses to invest in traning, particularly at its own training facility, the Loh Academy. The company is currently training some 200 young people in 20 different career fields, from industrial electronics, via warehouse logistics to IT systems management. And when they finally receive their certificates, they will join the approximately 1,500 upand- coming specialists who have already completed traineeships here over the years. 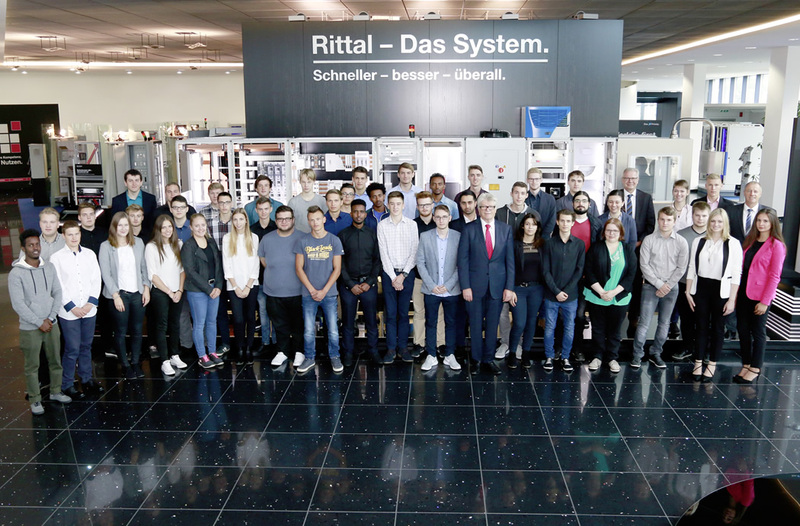 As a family-run company, the Friedhelm Loh Group attaches particular importance to a spirit of togetherness, and the trainees were able to experience what this means on their very first day. They explored the Rittal factory together, got to know each other better during a “speed dating” session, and reflected on these impressions in the informal atmosphere of an evening barbeque. 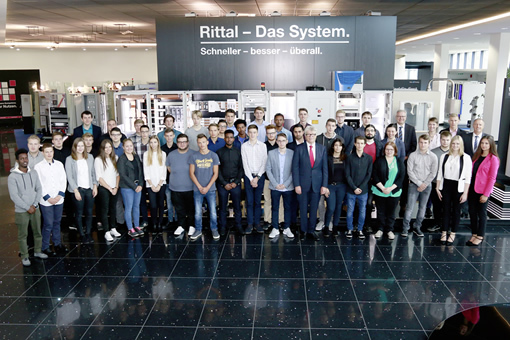 Among their number, there were also three refugees from Eritrea and Somalia, who had previously completed a three-month practical at Rittal within the framework of an integration project of the Friedhelm Loh Group and had thereby qualified for vocational training as machine and plant operators. Two of them are now official company trainees, and the third will be joining the training proper after a preparatory year to further develop his German language skills. Together, the trio is following in the footsteps of Khaibar Fatehzada and Eyobel Gebreyesus, who were already able to take up training at Rittal last year thanks to the pilot project which was initiated by the Friedhelm Loh Group to offer refugees Page 4 access to vocational qualifications – and thus the opportunity for a safe and peaceful future. 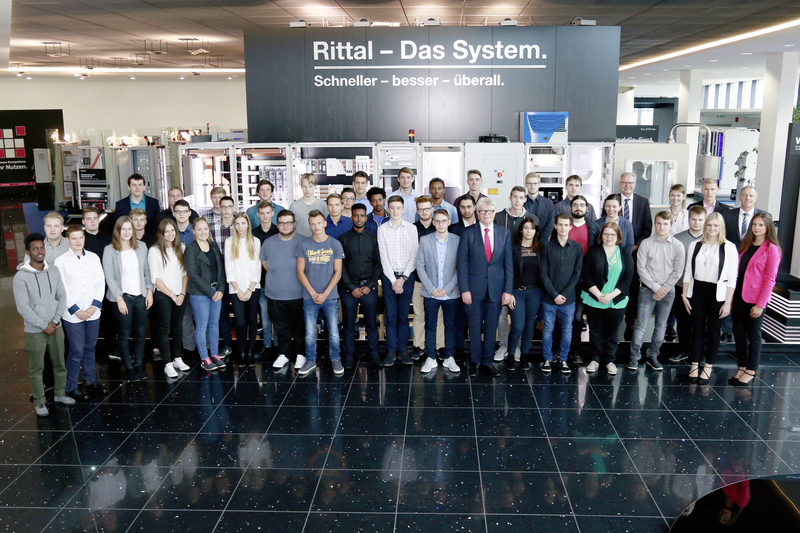 Image: Dr. Friedhelm Loh, owner and chairman of the Friedhelm Loh Group, welcomed this year’s 43 new trainees to the company.